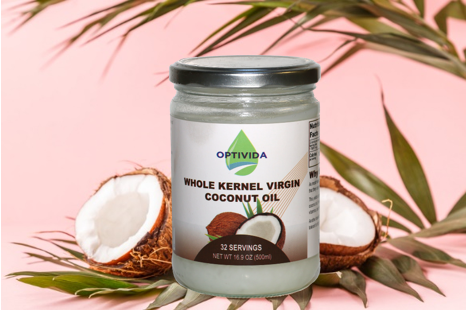 Optivida 100% Organic Whole Kernel Virgin Coconut Oil. Optivida's oil comes from the center of Sri Lanka's Coconut Triangle - only fresh coconuts are used to create this amazing coconut oil. The Whole Kernel Coconut Oil Process. The oil is extracted using an age-old “virgin” method of extraction. This cold-pressed at low temperature "virgin" method keeps all the nutritive value intact and leaves a taste and aroma unlike any other coconut oil. Most manufacturers of coconut oil remove the brown inner-skin of the coconut prior to processing so that they can get the white color of their oils, Optivida does not removed this skin. The Optivida whole kernel process yields a product that is off-white in color, but higher in anti-oxidants, vitamins, and minerals. Another benefit of using the whole kernel is that it makes our oil much more tolerant to high temperatures while cooking. Whole Kernel Virgin Coconut Oil contains More Iodine, Calcium, and Zinc than Regular Virgin Coconut Oil. Optivida 100% Organic Whole Kernel Coconut Oil comes from the center of Sri Lanka’s Coconut Triangle.